1 Chalet Hotel and 1 Self Catered Property. Together La Plagne and Les Arcs form Paradiski, Europe’s third largest ski area. With plenty of pistes above 2,000m, the area tops out at over 3,000m. This altitude, assisted by 470 snow cannons, means the resort is pretty reliable for snow. There is good terrain for all standards of skiers and every conceivable type of run. Directly above Les Arcs 1800 a series of chairs spread across the mountainside and can attract quite a crowd. The skiing here is largely easy and features the best nursery slopes in the area. Just below the resort is the terrain park with boarder cross spines, rails and boxes, although in the Paradiski are there are plenty of natural hits for boarders to play on. 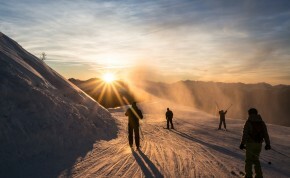 Les Arcs is known as the home of snowboarding and it is the perfect environment for beginners to learn in. Main mountain access is through the 2 stage gondola up to Les Arcs 2000 and the Aiguille Grive at 2,600m. From here there is an endless choice of tree-lined runs back down to Les Arcs 1800. Something the more confident skier should try is the Aiguille Rouge which stretches 7km back down to the Villaroger and is Europe’s biggest drop at 2,000m! Les Arcs is most famous for its speed-skiing track set above 2000 where many Olympic records have been broken. For a small fee anyone can have a bash, albeit from a lower starting point. The quiet tree lined village of Vallandry is magnificently positioned on a sunny plateau at the foot of the ski runs. A short lift away from all the skiing of the Paradiski area, Vallandry offers something to suit everyone's requirements. 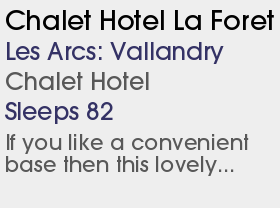 Peaceful and relaxing, Vallandry offers all the basic services with some shops, bars, restaurants and a cinema. Children will also enjoy the crèche and ski school which are located in the village. Les Arcs is getting its first five-star hotel, the Taj I Mah in Arc 2000 - quite a radical turn around in a resort where hotels of any kind are rare. It will have all the luxuries you might expect, including a Michelin-starred chef. 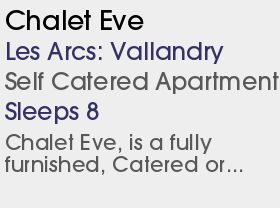 At Les Arcs, there s good news for Le Chantel (where a couple of the top residences are set). A new mini cable car now runs to this area from 1800, down the hill, greatly improving evening access to the main resort. And a new six-pack (Carreley) goes from here up to Col des Frettes, on the ridge above, creating a swift new route to Arc 2000.